In 1982, a patchwork of roughly fifty different companies, corporations and families operated and owned America’s radio stations, television stations and newspapers. Take a close look at what we mean when we talk about those mouths almighty and the “media concentration” they’ve already managed to finagle. 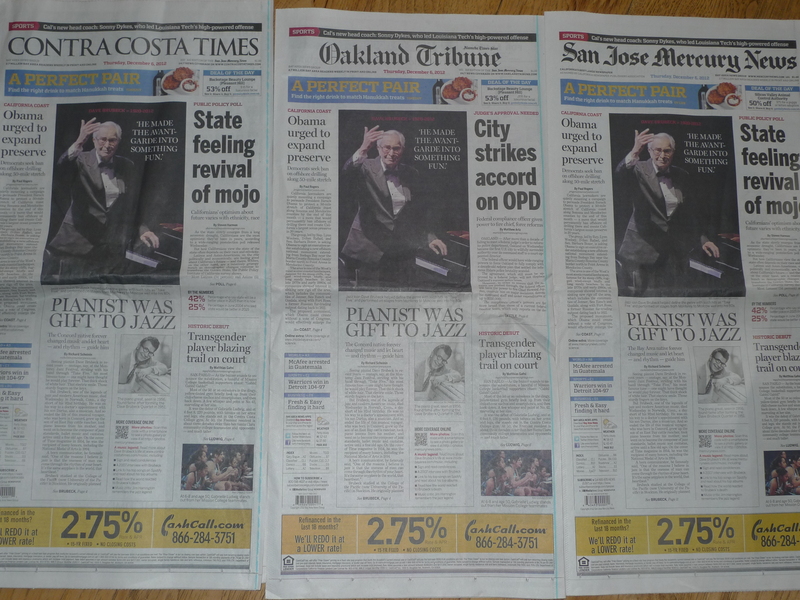 Here are three “different” papers in the same region on the same day. Just one story on all three front pages is original. These same newspapers once fought each other for the big scoop. The competition was fierce and the goal was protecting the public from corruption and malfeasance. Today’s news comes from the minds of a few and goes into the brains of an entire nation. This intensifying monopoly isn’t enough for the purveyors of cross-promotion,celebrity fluff, and war mongers. They want more. And they get it. This week, the head of the FCC resigned. While known for pushing openness on the internet, he was also working to convince the other four commissioners to allow the big time media-moguls to merge further—potentially devouring what little is left of the competition. In fact, the FCC chairman wanted to allow a single media conglomerate to own all three conduits of information in a given city. That means Viacom, Comcast, Disney, Time Warner, News Corporation and others would be allowed to own a newspaper, a television station, and a radio station in the same major market. Following the FCC chairman’s resignation, Rupert Murdoch’s News Corporation made a move to acquire The Los Angeles Times. Hmmm. But that’s only part of the problem. What has already happened in your hometown is frighteningly close to happening to the big, national newspapers as well. Each headline and story (based on the very same facts) are written with a different slant. The stories are spun in the direction of the trickle down views of those who own the newspaper. Providing unbiased stories that present all sides seems a distant memory. Remember when reading one newspaper, watching one broadcast, or listening to one radio show gave us enough rational information to make up our own minds? We were less divided and more socially united then. That is the saving grace of diversity–we are always richer for it–as our tolerance for other points of view provide “aha” moments of empathy toward others. Now, the FCC’s latest plan would allow News Corp, which owns The Wall Street Journal, FOX News and a variety of local stations in various markets, to also own other regional papers in towns where they already own multiple media outlets. Loud Mouths pushing agendas become mightier indeed. Current restrictions limit corporations like News Corp from purchasing the Los Angeles Times or the Chicago Tribune. If the rules are relaxed, News Corp could gobble up those information assets, effectively eliminating one of the last holdouts in the homogenization of the news—the nationally-focused city newspaper. 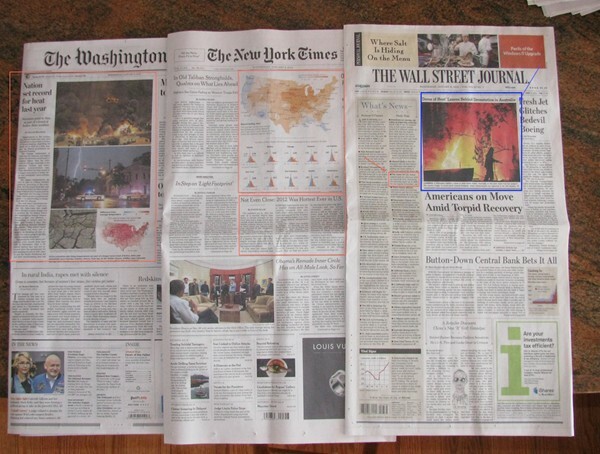 Imagine a possible future in which the L.A. Times, the Chicago Tribune and the Wall Street Journal all look the same—just like those three San Francisco Bay Area newspapers. The diet of the average news consumer is already too bland, too repetitive, too aggressively-biased or too innocuous. Our intellect is maligned and malnourished. In free market-obsessed America, we are quietly accepting the monopolization of the democracy’s life-blood—news and information. How are Pravda and the Chinese Communist news any different? Those “news agencies” are also ruled by a few mouths almighty. It’s funny how industrial (strength) capitalism looks a lot like communism when viewed through that perspective. It is very clear the FCC has already forgotten the airwaves were supposed to be owned by the public and used for the public good. But it is not too late. President Obama has a chance to keep the almighty mouths of mediocrity from becoming louder still—by saying no and shutting them up. However, if the President signs off on this plan, those of us seeking a variety of competing sources will have to go further underground to find ‘em—and that is never good. We cannot get caught not looking once again as the steroid-injected, money-loving, corporate mouths almighty ignore the public good. The media has predictably covered just about every frivolous story imaginable with barely a mention of what their bosses—the mighty mouths—plan to do next. Meanwhile, Mr. Obama is scheduled to make a decision on this any day now, so now is the time to write letters, make phone calls and fight to get the public’s attention. And what if the President signs off on this last government giveaway to the mighty mouths of the mega-media? Don’t expect to hear, see or read about it on the local or national news. The Mouths Almighty like to keep their victories quiet. It’s easy to do when they already own most of the networks, radio stations and newspapers. With the majority of reporters on their payrolls…sadly you are often on your own when it comes to stories that really matter. Gallery | This entry was posted in Cozy Bedfellows and tagged FCC Rules, mainstream media, media concentration, news corporation. Bookmark the permalink. 7 Responses to Mouths Almighty—Getting Louder? For obvious reasons, this corporatization of news, from big cities to small towns, is probably the most underreported very important story in this country. And, as is the case with how our elections are financed, if this does not change, not much else can. The amount of coverage of the HSBC money-laundering scandal by U.S. media should tell you how much independence there is. Crickets chirping. I’ll bet most of your readers haven’t even heard of this story. On the other hand, if you want the latest Kardashian or American Idol news, there are literally hundreds of “news” outlets with up-to-the-minute reports. Leslie Griffith and Joe Sottile have written an incredibly important commentary which we all should take note of and pass along to everyone we know. It’s pretty frightening to read, yet read it we MUST if we stand a chance of stopping this development. Thanks to Griffith and Sottile for their courage and brilliance. This is THE keystone story of our age. Thank you for your fearlessness Leslie and JP. Please never give up or close your minds and hearts to possibilities. The media ownership has stuffed the canary in the cage. Looks alive but is, in fact, is just a decoration in the mine shaft. But think of this reality: If people only buy what they like and they buy this (read: capitalist consumerism) then their game is over: the populous has no time, mind or desire for being a part of their own reality. Welcome to The Matrix. So come together, and know that while a separate effort amongst those awake cannot succeed, in a renewed cooperative and compassioned game we are undefeatable. I seriously can learn more about what’s wrong with the world from comic books at this point. I seem to remember you and I having this conversation when you were still working at KTVU Leslie (and I was working in retail doing some research); in about 2004. I’ve been back in Australia for 6 years and it’s happening here as well. I’m having the same arguments with media here. Strange thing is they cannot grasp that diversity is increasingly going to be their saving grace. With everybody increasingly able to select their own news sources via new media and technologies, should the media moguls continue hurrying down their current path, they will be ignoring the warning signs which will ultimately destroy their bottom line. Public policy is key here, and our states have to develop some strategies – quickly.